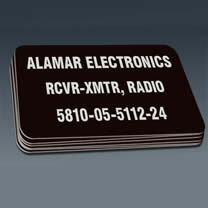 MPC’s Rigid AlumaMark BlackPLUS blank labels and tags are the most durable solution for use with YAG and Fiber lasers. The black background is sealed beneath a sapphire-hard anodic layer that provides an impenetrable surface, and expected exterior life of 20+ years. Rigid AlumaMark BlackPLUS blank labels are strong and lightweight. The thicker aluminum lends greater impact resistance in rugged environments making them ideal for asset tracking and product identification labels, property ID tags and more. Why Choose MPC's Rigid AlumaMark BlackPLUS Blank Labels & Tags?